Hallam Hope's effort looped over Fylde keeper Jay Lynch to seal the win for former Fleetwood boss John Sheridan's League Two Cumbrians. 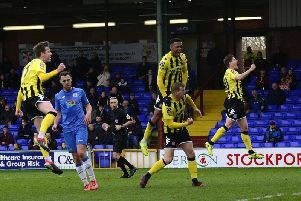 Winger Joe Cardle started for Fylde a day after joining the club but it was Carlisle who made the brighter start as Hope shot just wide from inside the box. Lynch was called into action for the first time on 10 minutes, saving a low effort from a corner. Fylde's first chance arrives on 15 minutes, when Serhat Tasdemir beat three defenders before shooting narrowly wide of the left post. One of the Coasters' two starting triallists was just off target with a flick from Danny Philliskirk's cross, then headed Cardle's cross wide as the home side got on top. Carlisle hit back as Jamie Devitt's drive from the edge of the box was well saved by Lynch and Richie Bennett looped a header over the top. Both sides had further chances before the end of an entertaining half, the best a 25-yard effort by Tasdemir which keeper Joe Fryer saved well three minutes before the break. Fylde introduced James Hardy and Danny Rowe for the second half but it was Carlisle who threatened first, Hope testing Lynch after cutting inside. At the other end, Cardle's penalty appeal was waved away and Rowe dragged his first shot wide from 25 yards. The hosts looked certain to take the lead on 65 minutes but somehow neither Rowe nor Philliskirk could convert Zaine Francis-Angol's cross from close range. It clearly wasn't Rowe's day as he saw an 18-yard effort crash against the bar, then his free-kick from just outside the box flew just over with five minutes left. The final twist came two minutes later from Hope's deflected effort, though Fylde had matched their Football League rivals and can look forward to Tuesday's home clash against Blackpool with confidence.